IN MY EARLY LIFE I made two very important discoveries. In the first place I discovered that making money was easy. And in the second place I discovered that making money and spending it foolishly was completely meaningless. I knew that this was not what I was here for, but at that time (this was many years ago), I didn't know exactly what I was here for. It was out of a very deep seeking for a meaningful way of life, and after having walked all one night through the woods, that I came to what I now know to be a very important psychological hump. I felt a complete willingness, without any reservations, to give my life, to dedicate my life to service. I tell you, it is a point of no return. After that, you can never go back to completely self-centered living. And so I went into the second phase of my life. I began to live to give what I could, instead of get what I could, and I entered a new and wonderful world. My life began to become meaningful. I attained the great blessing of good health; I haven't had a cold or headache since. (Most illness is psychologically induced.) From that time on, I have known that my life-work would be work for peace; that it would cover the entire peace picture - peace among nations, peace among groups, peace among individuals, and the very, very important inner peace. However, there's a great deal of difference between being willing to give your life, and actually giving your life, and for me, 15 years of preparation and of inner seeking lay between. During this time I became acquainted with what Psychologists refer to as Ego and Conscience. I began to realize that it's as though we have two selves or two natures or two wills with two different viewpoints. Because the viewpoints were so different, I felt a struggle in my life at this period between the two selves with the two viewpoints. So there were hills and valleys - lots of hills and valleys. Then in the midst of the struggle there came a wonderful mountain-top experience, and for the first time I knew what inner peace was like. I felt a oneness - oneness with all my fellow human beings, oneness with all of creation. I have never felt really separate since. I could return again and again to this wonderful mountaintop, and then I could stay there for longer and longer periods of time, and just slip out occasionally. Then came a wonderful morning when I woke up and knew that I would never have to descend again into the valley. I knew that for me the struggle was over, that finally I had succeeded in giving my life, or finding inner peace. Again this is a point of no return. you can never go back into the struggle. The struggle is over now because you will do the right thing, and you don't need to be pushed into it. However progress is not over. Great progress has taken place in this third phase of my life, but it's as though the central figure of the jigsaw puzzle of your life is complete and clear and unchanging, and around the edges other pieces keep fitting in. There is always a growing edge, but the progress is harmonious. There is a feeling of always being surrounded by all of the good things, like love and peace and joy. It seems like a protective surrounding, and there is an unshakeableness within which takes you through any situation you may need to face. You are now in control of your life. You see, the ego is never in control. The ego is controlled by wishes for comfort and convenience on the part of the body, by demands of the mind, and by outbursts of the emotions. But the higher nature controls the body and the mind and the emotions. I can say to my body, "Lie down there on that cement floor and go to sleep," and it obeys. I can say to my mind, "Shut out everything else and concentrate on this job before you," and it's obedient. I can say to the emotions, "Be still, even in the face of this terrible situation," and they are still. It's a different way of living. The philosopher Thoreau wrote: If a man does not keep pace with his companions, perhaps he hears a different drummer. And now you are following a different drummer - the higher nature instead of the lower. IT WAS only at this time, in 1953, that I felt guided or called or motivated to begin my pilgrimage for peace in the world - a journey undertaken traditionally. The tradition of pilgrimage is a journey undertaken on foot and on faith, prayerfully and as an opportunity to contact people. I wear a lettered tunic in order to contact people. 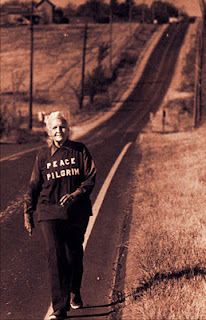 It says 'PEACE PILGRIM' on the front. I feel that's my name now - it emphasizes my mission instead of me. And on the back it says '25,000 MILES ON FOOT FOR PEACE.' The purpose of the tunic is merely to make contacts for me. Constantly as I walk along the highways and through the cities, people approach me and I have a chance to talk with them about peace. I have walked 25,000 miles as a penniless pilgrim. I own only what I wear and what I carry in my small pockets. I belong to no organization. I have said that I will walk until given shelter and fast until given food, remaining a wanderer until mankind has learned the way of peace. And I can truthfully tell you that without ever asking for anything, I have been supplied with everything needed for my journey, which shows you how good people really are. With Me I carry always my peace message: This is the way of peace: Overcome evil with good, falsehood with truth, and hatred with love. There is nothing new about this message, except the practice of it. And the practice of it is required not only in the international situation but also in the personal situation. I believe that the situation in the world is a reflection of our own immaturity . If we were mature, harmonious people, war would be no problem whatever - it would be impossible. All of us can work for peace. We can work right where we are, right within ourselves, because the more peace we have within our own lives, the more we can reflect into the outer situation. In face, I believe that the wish to survive will push us into some kind of uneasy world peace which will then need to be supported by a great inner awakening if it is to endure. I believe we entered a new age when we discovered nuclear energy, and that this new age calls for a new renaissance to lift us to a higher level of understanding so that we will be able to cope with the problems of this new age. So, primarily my subject is peace within ourselves as a step toward peace in our world. Obstacles Come All The Time. If you get upset that means the ego is back. When obstacles come if you're not upset and you're still present, you will look at whatever the obstacle is with a penetrating gaze of presence, which is stillness also. You look at whatever obstacle arises, you bring this penetrating stillness to it, and that is like a light that shines on it and dissolves the obstacle or shows you a way around it. That's the power of consciousness. In This Materialistic Age We Have Such a False Criterion By Which to Measure Success. Booklet by Peace Pilgrim: "Steps Toward Inner Peace"